PITTINGER, WILLIAM, Sergeant, Company G, 2d Ohio Infantry. BENSINGER, WILLIAM, Private, Company G, 21st Ohio Infantry. BUFFUM, ROBERT, Private, Company H, 21st Ohio Infantry. PARROTT, JACOB, Private, Company K, 33d Ohio Infantry. One of the 19 of 22 men (including 2 civilians) who, by direction of Gen. Mitchell (or Buell), penetrated nearly 200 miles south into the enemy's territory and captured a railroad train at Big Shanty, Ga., in an attempt to destroy the bridges and track between Chattanooga and Atlanta. The mission was conceived and led by James J. Andrews, a civilian spy for the Federal government, who recruited 19 volunteers from an Ohio brigade in the Army of the Tennessee to accompany him. They and two other civilians were to infiltrate the Confederate lines in small groups in civilian clothes, posing as Kentuckians traveling to Atlanta, Georgia to join the Confederate Army. Once in Atlanta, they were to hijack a Confederate train and take it northward toward Chattanooga, Tennessee, tearing up the railroad tracks and burning the railway bridges behind them, cutting off the main supply line for the besieged city of Chattanooga. They initially succeeded in hijacking the train, powered by a locomotive named The General, but the plan was foiled by the conductor of the train, William Fuller, who after being left behind immediately went in pursuit, first on foot, then by handcart, then by a small switch engine and finally by catching up to another locomotive named the Texas. Fuller and the crew of the Texas managed to stay close enough behind Andrews and the raiders on The General that the raiders were never able to stop long enough to inflict significant damage on the railway. With Fuller sounding the alarm while in pursuit, Confederate cavalry troops were able to head off The General. Andrews and all of his raiders abandoned the train and fled. All were captured within a week. Andrews, the two other civilians and five of the soldiers were eventually hanged as spies. The others endured whippings and other torture, but managed to escape en masse after a few months. The six men listed here were recaptured and subjected to more beatings and other torture before finally being freed in a prisoner exchange. They were the first recipients ever of the Medal of Honor, awarded by Secretary of War Edwin M. Stanton on March 25, 1863. The others who had succeeded in escaping also eventually received the medal. At the time of the conception of the Medal of Honor, there were no provisions for a posthumous award; otherwise it is assumed that the soldiers who were executed might have also received it. The film is a straightforward account of the raid with few known embellishments or deviations, with as much of the violence as could be depicted in a Walt Disney movie of the 1950s. The film opens in Secretary Stanton's office with the six recipients lined up, and then the raid is seen in flashback through the eyes of Sergeant Pittinger (who eventually wrote a book about the raid), with Fess Parker portraying Andrews and Jeffrey Hunter as Fuller. 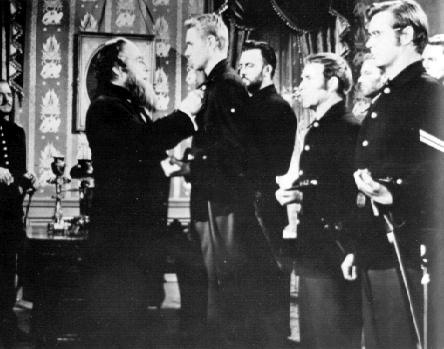 One of the more dramatic moments occurs after the raiders are captured and Fuller visits Andrews in prison; as is often seen in movies of the American Civil War, there is no personal animosity between the two opponents, only a grudging mutual respect for each others' actions. The raid had also been the basis of another film nearly three decades earlier, the 1927 silent film classic The General, presented as a comedy. Buster Keaton produced, wrote, directed, and had the starring role based on William Fuller, although as an engineer rather than a conductor, with the added twist of his sweetheart being aboard the hijacked train. Andrews and his raiders were, of course, the Bad Guys in this one.